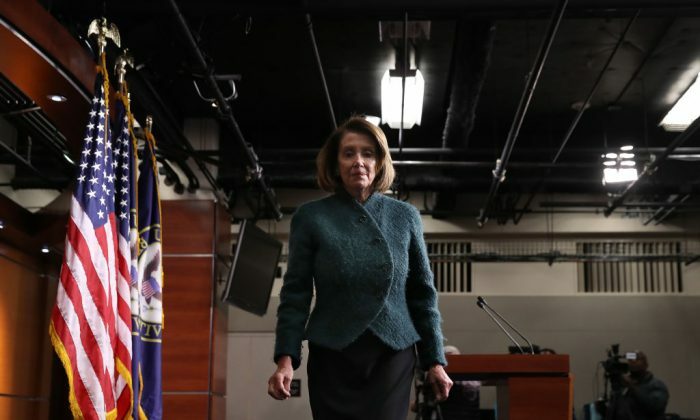 As the partial government shutdown stretched into its 32nd day, a group of centrist House Democrats are calling on House Speaker Nancy Pelosi (D-Calif.) to end the stalemate over funding for the U.S.-Mexico border wall and to offer a compromise. President Donald Trump has made several attempts at a bargain. On Jan. 19, he outlined an offer which would provide temporary protection from deportation to some 700,000 illegal immigrants that came to the country as children. In exchange, Trump wants $5.7 billion in border wall funding. Trump’s proposal, outlined in a televised address on Jan. 19, was rejected by Pelosi before he started to speak. Rep. Elaine Luria (D-Va.), who is leading the group of centrist Democrats, urged Pelosi to offer Trump a vote on his border wall sometime in February if he ends up signing a bill to reopen the federal government. “We know that you share our value that effective governing should not result in winners and losers, but that our job as legislators is to do the most good for the most people,” the letter (pdf) obtained by Politico stated. “We understand that this shutdown was not caused by the 116th Congress, but it is our job to fix it,” it continued later. Both Pelosi and Senate Minority Leader Chuck Schumer have said they would not negotiate with Trump over border wall funding until he reopens the government. They said that they would be open to talks after he has done so. Yet, when Trump asked Pelosi whether she’d give him the wall money if he let the government open and allowed for a month of negotiations, she said no. In the draft letter that did not include the names of any caucus members, the caucus requested Pelosi “immediately begin debate in committee” on the wall after the reopening of the government. Democrats say this will allow the Department of Homeland Security to detail the funds needed and present them to the president, guaranteeing a vote for the supplemental funding request on the House floor by the end of February. Federal workers who have been furloughed will miss their second paycheck if the shutdown continues to Jan. 25. The shutdown hit about 25 percent of the federal government, with some 800,000 federal works affected. Meanwhile, Senate Majority Leader Mitch McConnell (R-Ky.) is preparing to bring Trump’s compromise offer to the floor sometime this week. McConnel has rejected all the measures passed by Democrats in the house to reopen the government because Trump did not agree with them. Trump appeared to be happy with the job McConnel and other Republicans were doing on the border wall. “Never seen @senatemajldr and Republicans so united on an issue as they are on the Humanitarian Crisis & Security on our Southern Border,” he said on Twitter on Jan. 22. Democrats refuse to budge from their initial $1.3 billion offer for border-security purposes, which doesn’t include funds for a border wall. After Pelosi rejected Trump’s compromise offer, the president took to Twitter and chided Democrat leaders for their refusal to negotiate. Pelosi quickly shot back on Twitter. “800,000 Americans are going without pay. Re-open the government, let workers get their paychecks and then we can discuss how we can come together to protect the border,” she wrote.